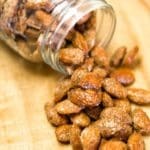 Sweet and crunchy Keto Candied Almonds are one of our favorite keto snacks! They are the ideal snack for enjoying on the go. Place the almonds, sweeteners, and cinnamon in your slow cooker and set to low. In a small bowl, whisk the egg white and salt until foamy. Add to the nuts and mix well. Place some paper towel over your slow cooker before putting on the lid. Cook for 2 ½ hours, stirring every 30 minutes. Add the water, stir well, then cook for another hour. Stirring halfway through. Pour the almonds onto a cookie sheet lined with parchment paper to cool and dry out. Once cooled, stored in an airtight container on the counter for up to 2 weeks.